The word “Percent” can be understood as “per 100” or “out of 100”. Percentage in itself is a dimensionless number used to tell how many parts per hundred are being considered. It is often denoted using the percent sign, “%”. The reference point for calculating percentage is taken as 100. If in a class of 100 students, 90 students passed in a subject then the percentage of students who passed in the exam is 90%. Had the total number of students been 200, the percentage would have reduced to 45%. This is because 45 students out of every 100 students passed in the exam. Mathematically, it can be calculated as (90/200)*100= 45%. Conversely, we can say that if 45% students out of a total of 200 students passed the exams then the number of students who passed the exam is 90. Mathematically it can be expressed as (45/100)*200= 90. From CAT point of view, percentage is essentially the most basic topic which has universal application i.e. it comes handy in other quant topics as well as in LR/DI. 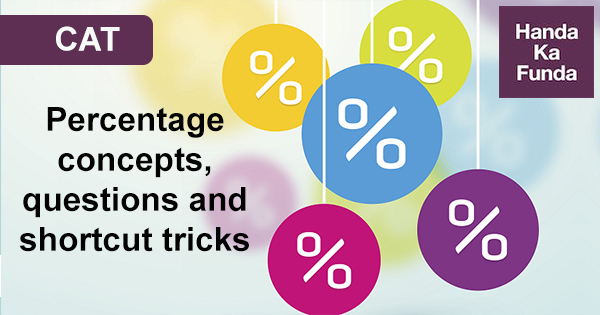 Let us look at some examples and learn more about percentages. Example 1 – In a class of 60 students, 20% are male. 75% of female students passed an exam conducted for the whole class. What is the number of female students who passed the exam? Solution– Since it is given that 20% of students are male, that means remaining 80% are females. This can come in handy during certain calculations. For example- 63.63%= (9.09*7) % = 7/11. Similarly 44.44%= 4/9 and 37.5%= 3/8. Problems related to percentage increase or decrease form a major part. Example 3– The wheat production increased from 50 million tons to 70 million tons. What is the percentage increase? Example 4 – The wheat production increased by 40% on a value of 50 million tones. What is the present wheat production? Solution– Whenever there is any percentage increase or decrease on a quantity, we can directly calculate the new value of the quantity instead of calculating the actual increase/decrease and then adding/subtracting from the original quantity. On generalizing, we can say that if percentage increase is p%, then the new value is (p/100 + 1) times the old value. Conversely, if the new value is k times the old value, then the percentage increase is (k-1)*100. Example 5- If A’s salary is 20% more than B’s salary. Then B’s salary is what percentage less then A’s salary? Example 6 – Price of a commodity increased by 30%. By what percentage should it be reduced to bring it to actual level? Example 7 – If my salary went up by 30% and then decreased by 30%, what is the net change? After decrease- (0.7)*1.3x= 0.91x, which gives us a decrease of 9% from the original salary of x.
Generalize, if a quantity increases by p% and then decreases by p% then there is net reduction of (p^2)/100 %. We have looked at all the basic examples and concepts. Let’s work out some problems. Problem 1 – If the price of sugar goes up by 10% , then what should be the percentage decrease in the quantity consumed so that the total expenditure on sugar remains the same? Solution- Let s be the price of sugar and q be the quantity consumed . Since the price is increased by 10% , the new price is 1.1s . Let the quantity of consumption be r.
Problem 2 – Bholu conducts his business in the following manner : Every once in while he raises his prices by a certain percentage and a while later reduces his price by the same percentage. After one such updown cycle of increasing and then decreasing his price by x% , the price of the commodity decreases by Rs 100 . In the next cycle, he increases and decreases his price by (x/2)% and then sells the commodity for Rs 2376. What is the initial price of the commodity ? Solution: Let the initial price be P.
Problem 3 – A society had raised 60% of the amount it needed for a new building by receiving an average donation of Rs 300 from people it had already solicited. The people already solicited represent 80% of the people society intends to ask for donations. The society wants to to raise the exact amount it needs for the new building . Find the average donation it should receive from the remaining people to be solicited. Solution : Assume the amount the society needed for the new building to be A. Let the sum of people already solicited and to be solicited be N.
If the average donation the society should receive from remaining people to be solicited be x. Percentages is a very important topic for CAT. The concepts will be used in profit, loss , data interpretation and many other topics. Practice it well. Good luck ! Quantitative Aptitude – Arithmetic – Percentages – Q2: Out of the shirts produced in a factory, 15% are defective, while 20% of the rest are sold in the domestic market. Quantitative Aptitude – Arithmetic – Percentages – Q3: The number of girls appearing for an admission test is twice the number of boys. Quantitative Aptitude – Arithmetic – Percentages – Q4: Ravi invests 50% of his monthly savings in fixed deposits. Thirty percent of the rest of his savings is invested in stocks and the rest goes into Ravi’s savings bank account.